Trump said he believes "the law is 100 percent on my side." But is it? The key question, a tax lawyer asks, is whether Treasury Secretary Steven Mnuchin has any legal basis to refuse the House Ways and Means Committee's request. (WASHINGTON) — President Donald Trump’s lawyer said on Friday that the Internal Revenue Service should reject a request from the Democratic chair of the House tax-writing committee to produce the president’s tax returns. 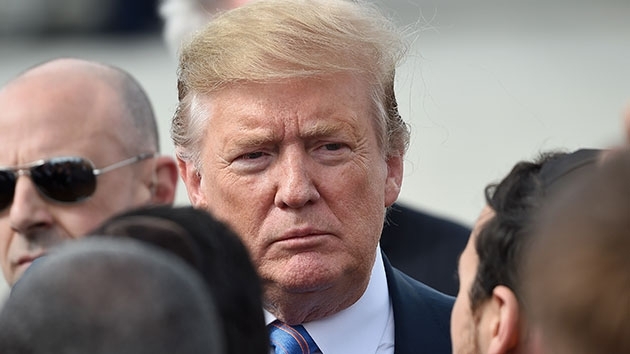 Steve Rosenthal, a senior fellow in the nonpartisan Urban-Brookings Tax Policy Center and a tax lawyer with 25 years of experience, said the law is stacked against the president and in favor of House Ways and Means Committee Chairman Rep. Richard Neal, D-Mass. Rosenthal said the law couldn’t be clearer. The key question, Rosenthal added, is whether Treasury Secretary Steven Mnuchin has any legal basis to refuse Neal’s request. But while the provision has been on the law books for nearly a hundred years, Neal’s request is in uncharted territory. There is no precedent by which the Ways and Means Committee has ever sought to use the provision to request a president’s tax returns, even though Rosenthal believes Neal’s request is a legitimate. Trump has also broken with modern practice by not voluntarily turning over his tax returns as a candidate. Since the 2016 campaign, Trump has consistently cited an ongoing audit as the reason for not making his returns public. But Rosenthal countered that Congressional oversight of the executive branch qualifies, in his mind, as a legitimate legislative justification in this case. But the president’s lawyer, in his letter to the IRS, makes the case that Neal has an ulterior motive. “His request is a transparent effort by one political party to harass an official from the other party because they dislike his politics and speech,” Consovoy wrote. The president made a similar argument Friday in remarks to reporters. “I got elected. They elected me, and now they keep going. I’m under audit. When you’re on audit, you don’t do it. Other people are under audit. Nobody would do it when you are going through audit, and I’m always under audit. They audit me all the time,” Trump said after his lawyer issued the statement. Legal arguments aside, the table is now set for the expected scenario that the Treasury Department will decline to comply with Neal’s request, after which Neal would have to issue a subpoena to compel the Treasury Department to hand over the returns. If Treasury again declines, a legal battle would almost certainly ensue, likely escalating to the Supreme Court. An additional course of action for Neal, Rosenthal said, would be for the House to potentially vote to hold Steven Mnuchin, who oversees the IRS as treasury secretary, in contempt of Congress. If Neal does succeed in ultimately obtaining the president’s tax returns, it’s conceivable that the returns could eventually be made public. While Neal would be initially obligated to keep the returns private, the Ways and Means Committee could take a vote to share the information in an open session. If that voted succeeded, which is likely along party lines, the returns could be made public. The White House declined to comment on this report. The Treasury Department did not respond to a request for comment.